When I was growing up, my family never had a dishwasher. Correction. Dad said he had three dishwashers, my sister, my brother, and me! We took turns hand washing dishes and drying them with a cup towel after every meal. We learned that washing dishes by hand is a time for bonding. Dad was pretty strict. If we left food on something, everything had to be rewashed. At the time I thought that was 'stupid,' but as an adult, I realize he was trying to teach us to do things the right way the first time. I usually washed, while my sister dried, but sometimes Mom would help us. When she washed, we would sing together in three part harmony. Once in a while, my brother would join in to make it four part. Dad didn't sing, but he would come in and listen while we worked. When we ran out of songs to sing, he would tell us stories about his childhood, or about trips he had taken. Other times, we would play riddle games while we washed dishes. No, we didn't have a dishwasher while I was growing up. And we didn't miss it, either. I have usually had one, as an adult, but even when we lived in houses that had dishwashers, we did not use it. And you know what? I still don't use it. Instead, my husband or I (or both of us) will wash the dishes by hand. 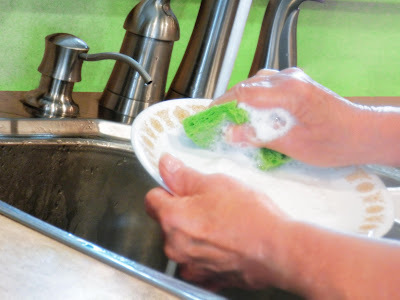 Partly because too often dishwashers leave food on the dishes, and they have to be rewashed, but mostly because dishwashing is a time we can spend a few minutes together discussing a huge variety of topics. In fact, we get done long before a dishwasher would, and still have time to do other things. The dish soap we use at our house is Dawn Dish Soap Concentrated Original Scent. Even when water is not really hot, Dawn will remove greasy cooked-on food from my pots, pans, and dishes. It works great as a pre-treatment for ring-around-the-collar in clothes washing, too. And to save even more money, I mix Dawn half and half with water to refill hand washing pump bottles. One item you will find in almost everyone's home is a dishrack. Designer dish racks can make a daily chore more fun! When you eat, dishes get dirty. When you wash dishes (by hand), you need a rack to set them in, especially if you air dry your dishes. Dishracks are easy to find in most department stores. You can buy a simple plastic version that will do an adequate job. No need to spend lots of money. However, there are some that do more than just dry your dishes. Some add a bit of fun or sophistication to your kitchen. The designer dishrack pictured here would be a sophisticated addition to almost any themed kitchen. All it needs is a drain board or thick terry towel beneath it to catch the water dripping from wet dishes. Personally, my kitchen decor is red. This dish rack is neutral, so it fits perfectly with the color scheme, and brings in a bit of fun, too. Wrought iron is one of my favorite decorating tools. rinse water to help kill germs. This attractive bamboo and stainless steel dish-drying rack looks great on the kitchen countertop. The design makes it perfect for drying cups, plates, and even pots and pans. There is a flatware holder with perforations so that flatware is not sitting in drained water. The bamboo drainer board has deep grooves to capture and control water dripping off of dishes. The rack measures 19" X 5" and almost 3 1/2 inches high. Every home should have a dishrack, even if it is kept hidden beneath the counter. Do you prefer a simple, plastic dish rack, or do you prefer a more decorative dish-drying rack?